courses in addition to his lyceum lectures. His lectures developed into essays and books, and he began publishing these in the early 1840s. 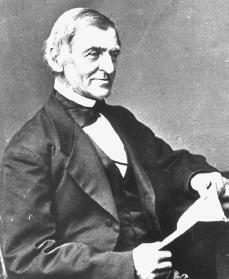 Emerson's next book, after the second series of essays, was a volume of his poems. After that came more than one remarkable volume of text. In Representative Men: Seven Lectures (1850) Emerson considered the similarities of great men, devoting individual essays to such figures as Plato (c. 427–c. 347 B.C.E. ), William Shakespeare (1564–1616), and Johann Wolfgang von Goethe (1749–1832). English Traits (1856) resulted from an extended visit to Great Britain. Abraham Lincoln died in 1865, not 1965 (typo). I did not copy the public, thinking you might revise the typo.